"This camp was so awesome because we did a lot of skits, games, keertans and we learned about Radha Krishna. Didi Ji was kind, sweet and not strict. We had so much fun learning about God and Guru since the teachers were nice and helpful. Our favorite part was learning about and playing Holi. We loved singing bhajans because they were so peaceful and made us dream about God. We will miss this camp and especially Didi Ji. We hope that we can come back next year." "We were are so glad that we had listened to Didi Ji's discourse in Shree Mandir, Atlanta and there we heard about the Hindu youth camp. This was our first camp. It is absolutely a hidden gem. There were plenty of activities, all so well organized and enjoyable. Even, Didi Ji was available during the day to have one on one with the children or adults if we requested. All the wisdom and knowledge by Didi Ji and the committed teachers was conveyed in such a devoted and loving manner. Even the parents who accompanied the kids had plenty of activities. I must say I was not sure if this camp was for the kids or the adults. This was truly a pot of gold at the end of the rainbow. Thank you for such dedicated service and we will see you next year." These are signs of success. Please let me know what else I can assist with, because I do believe that the best thing we can do for anyone, more so children, is to teach them about Shri Krishna." Thanks to Roshni, Ram Bhaiya, Priyavrat Bhiaya, Devika Ji, Chaitanya Bhaiya, Kumar and many parents, volunteers and youth volunteers for their hard work during our stay at the camp. The quality of summer camp has been only improving every year, so in my views this year was the best summer camp experience so far. Not to exaggerate, but, even with the heat (which we do not have control on), children didn’t seem to be too bothered. The reason may be constant cold water and juice supply in the dining hall (Big water coolers) as well as at Sadhana Hall. I congratulate the volunteers for an awesome job organizing the festivals! I know it takes a lot of thinking and preparation beforehand, so children can take part , feel connected and enjoy the rich Hindu festivals. These have been a great experience every year. I still get goose bumps remembering the Shiv Parvati Vivah during the 2nd summer camp. Let us keep making them better and better every year. Have a great summer ahead. I am already looking forward to the winter retreat! 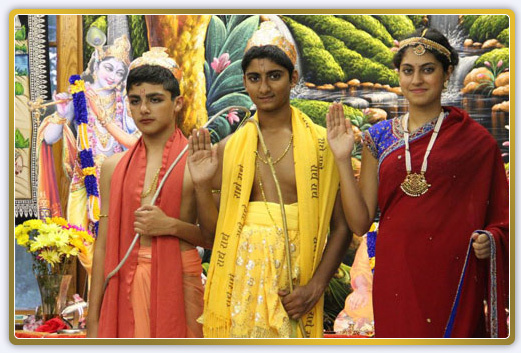 The Hindu Youth Camp in Atlanta Georgia was an amazing experience enjoyed not only by the kids but also the parents. The camp schedule was so meticulously planned that each and every day was filled with fun and learning. Kids not only learned about the festivals but also celebrated them in the camp. On the day of Holi the camp site was filled with color, music and laughter all around. I firmly believe that this is one of the best camps and each and every Hindu should take the opportunity to attend it. Thank you Didi Ji for this amazing experience. It was a very well organized camp.